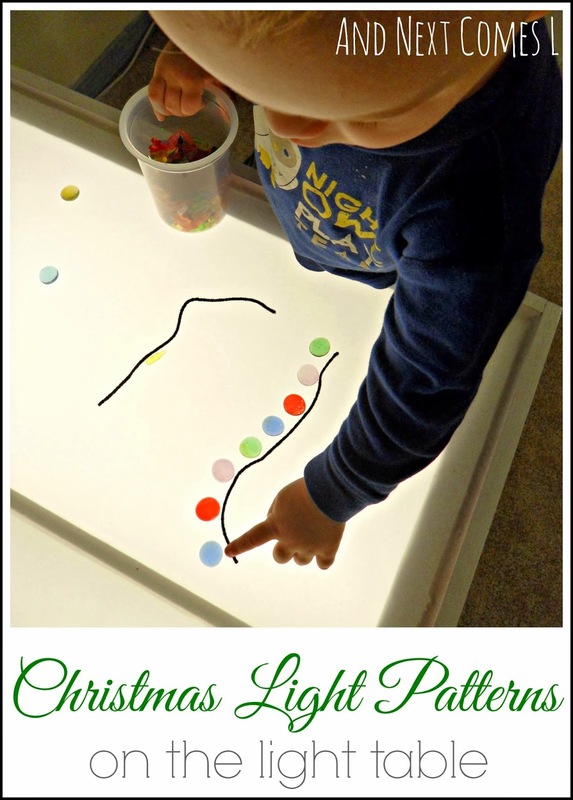 After doing some Christmas themed light table play last week, I came up with this Christmas light table activity that focuses on patterns. Perhaps you have noticed how a string of Christmas lights usually follows some kind of pattern, such as red bulb, yellow bulb, blue bulb, green bulb, and repeat. Well, that was the inspiration for this Christmas light table activity for kids. 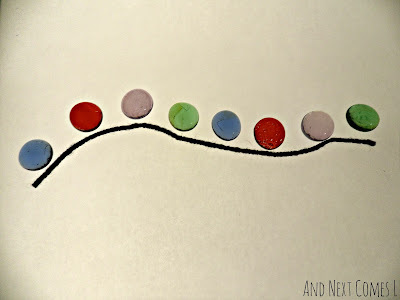 This activity only requires a few materials: some pieces of yarn and some colored glass stones (or even light bright pegs work as you will see). Oh and you'll need a light table too (or light box or light panel). I created on pattern of lights (pictured above) for inspiration, encouraging J to come up with some patterns by himself or to try copying my pattern, if he preferred that instead. He decided to make his own patterns. K, on the other hand, was more interested in observing and describing the patterns. He loved to point to the individual "lights" and name the colors. Then J gathered some light bright pegs and created some more Christmas light patterns on the light table. After making a few dozen patterns, J turned my idea into something of his own...a face! Cute, right?